Here are two photos of Kali trying for 2 hours to escape her cage after school. Kali is the beautiful ball python that is our class pet. She was actually lifting up the wooden lid with two reams of paper on top with just her nose! Although she was no where close to being out of her cage, I was impressed with her strength and determination. It's like she had the power of a hundred hamster souls inside her that night. I know that I've had slightly traumatic feedings with Kali, but I'm starting to warm up to her. She's very snuggly and likes to constrict around the neck. I almost passed out at the copier machine as I was wearing her around as my most fashionable accessory while the students cleaned her cage. 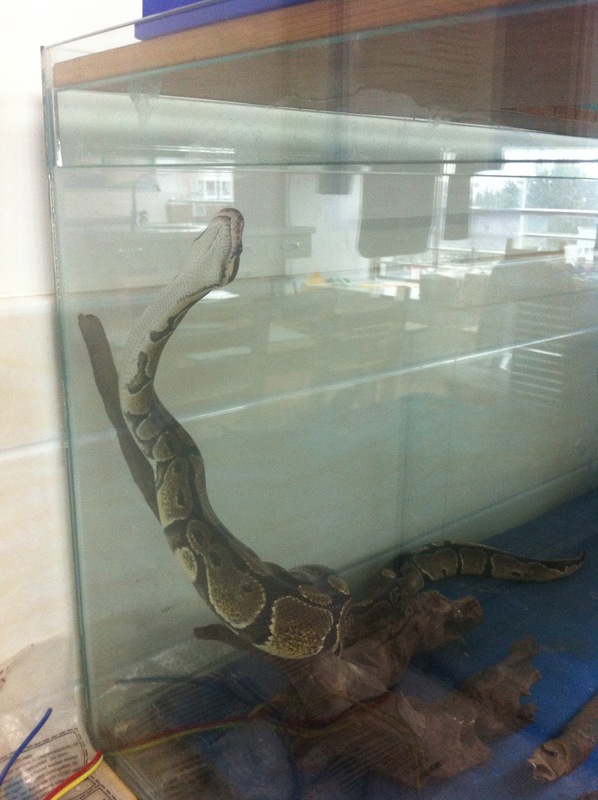 I just scored a ball python as my class pet too!! We are still getting to know each other. Dan also got me a surprise class pet tarantula. Her name is Hairelena. I MISS YOU AND LOVE YOU CUZ. You knew an Ella photo was coming! My IKEA is better than your IKEA.